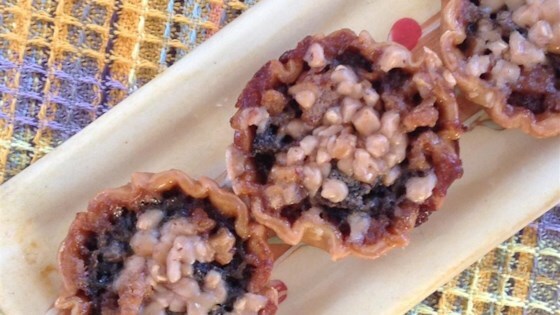 "Traditional Canadian butter tarts with a delicious twist - dried cherries replace the standard raisins, and the optional melted toffee bits provide a sweet, chewy topping." Preheat oven to 450 degrees F (230 degrees C). Spray twelve 3-inch tart tins with cooking spray. Roll out pie crust on a lightly floured surface and cut twelve 4-inch circles with a cookie cutter, rerolling scraps if necessary. Line tart tins with pastry circles. Beat eggs, brown sugar, vinegar, and vanilla together in a bowl until smooth; stir in melted butter, cherries, and walnuts. Fill tart shells 2/3 full with butter mixture. Bake in the preheated oven for 10 minutes. Reduce oven temperature to 350 degrees F (180 degrees C) and continue baking until crust is golden and filling is bubbling, about 20 minutes. Remove tarts from oven; sprinkle evenly with toffee bits. Return tarts to the oven; bake until toffee bits are just melted, about 5 minutes. Cool on a wire rack, about 15 minutes. Gently lift tarts from tins. This recipe makes 2 dozen 2-inch mini tarts. Cut pastry into 24 (2 1/2-inch) circles for mini tarts. Far too much sugar. Too much cherries. They were nice. I think it is the toffee that makes it. May make it again.